Born in 1986, Alexandre Vay started playing music at the age of 5. In 2005, he entered the “Conservatoire National Supérieur de Musique de Lyon” (CNSMD) and studied in the class of Yvan Chiffoleau. After three years he graduated with the first Prize by unanimous decision of the jury. In 2008, he decided to perfect himself with Martin Ostertag at the University of Music in Karlsruhe, where he successfully obtained a Master’s in 2012 and a Diplom of Soloist in 2014. Passionate about chamber music, he formed a duo with pianist Dimitri Papadopoulos with whom he obtained a Master’s degree in chamber music at the Conservatory in Lyon. Following numerous concerts of Beethoven’s complete sonatas for cello and piano (Lyon, Arras Theatre, Strasbourg, Bangkok, …), the Conservatory invited the duo to record a CD of Beethoven’s complete sonatas. In 2011, they won the third prize at the International Competition of Chamber Music “Max Reger”. They were subsequently invited by Frederic Lodéon to perform on the french radio programs “Plaisirs D’amour” (France Musique) and “Carrefour de Lodéon” (France Inter), « Chamber music concerts » on the Bavarian Radio and SWR in Baden-Baden. 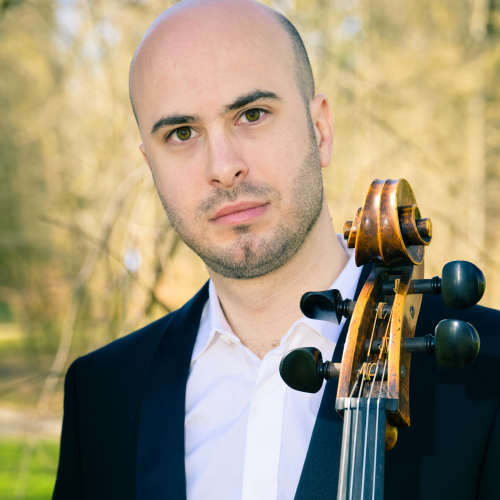 Alexandre performed as a soloist with numerous orchestras, including the Munich Radio Orchestra, the Baden-Baden Philarmonia Orchestra, the San Pedro Sula Philarmonic (Honduras), the Orchestre du Mans and in numerous festivals across Europe, such as the Épau festival in Le Mans, the summer festival in Epernay, the Thy Chamber Music Festival in Denmark, the Chamber music Festival of Cervo Italy, and other festivals in Romania, Russia and Thailand where he gave the first concert with the complete Beethoven’s works for cello and piano in 2014. In 2013, Alexandre performed in a series of seven concerts at Karlsruhe’s Opera, where he played three suites by J.S. Bach (2, 3 and 6), accompanied by dancers (choreographed by H. Spoerli). Passionate about teaching, Alexandre is a cello Professor since 2009 at the Summer Academy of Music in Trouville/mer and at the Summer Academy in Craponne. He has given Masterclasses in Lyon, Le Mans, Bangkok and San Pedro Sula (Honduras). He also recorded the first cello Suite by Bach for a special “prenatal” recording: (Fuzeau edition) and the complete piano trio and piano quartet of R. Strauss with Daniel Blumenthal, Doren Dinglinger, Tony Nys (CPO Label). Alexandre is supported by Societe Generale’s Foundation, ADAMI, the Baden-Württemberg Instruments Foundation and the «Palazzetto Bru Zane».